Kitchen cabinets are meant to hold tupperware, pots and pans and all other kinds of kitchen nick-nacks . The biggest struggle is keeping everything behind those doors organized . Nothing is worse than opening the door to grab a tub and getting hit by rogue plastic containers . Any Kitchen Cabinets renovation should address the way a Christchurch joinery is going to design cabinets for the ease-of-use . Christchurch joinery like Kitchen Maker can give you dream cabinets that keep everything clutter-free and organized . Cans, cereal boxes, and more seem to pile up in the cabinet . There is always a struggle to find things if there aren’t enough shelves Kitchen Cabinets renovation should address this either with a walk-in pantry with great lighting. An old utility closet can be retrofitted with plenty of shelves to create a dream pantry. A pull-out pantry can be installed for easy access to everything . This too should have plenty of shelves and spaces for all of your rice,flour,sugar and more. No matter what your new pantry should make everything easily accessible and adequate lighting makes everything easy to see and retrieve without making a mess . Lids and pots never seem to stay together in organized . Some people just stick everything in the oven but this becomes a pain when it’s time to bake, you have to remove everything .Having a rack or shelf for the lids and another for the pots is helpful solution that can keep things organized . Another solution is to use hooks to hang pots and lids up above to keep them out of the way and organized . But this is only recommended if you have nice cookware and you don’t mind people seeing them on display all the time . This is common in a large designer Kitchen Cabinets that focus on not only design but function. Tupperware is usually a nightmare to keep organized . But where would you put the leftovers if you didn’t have all of your tupperware . All shapes and sizes, round and square, small and large, at some point in time we are going to need it . To keep tupperware from escaping the cabinets in an avalanche it’s best to keep them in drawers made with pockets to keep lids and bottoms neat and tidy . Separate compartments allow you to see everything you have without having to pull it all out. Keeping tupperware in a low allows for ease of access as well. Spices take your meals from bland to masterpieces that everyone craves . You need a lot of different spices to make the many different dishes, but it can be difficult to find the right spices for a dish when they are all cluttered into a cabinet. An excellent solution is to build tiered shelves so that way no spice is blocking another . This makes it easy to search for the things you need . Another solution is to have racks built into the doors what spices you use most often are clearly inside and easy to access. Trash cans can be smelly and if you have pets in the home can become a possible hazard . Trash cans in the kitchen often keep Kitchen Cabinets scraps and empty fast food containers that can be an eyesore if just left out . a great solution is to turn a cabinet into a storage for the trash can . you can anywhere from a 4 to 10 trash can comfortably in a cabinet on a drawer that pulls out of it . this keeps the trash can out of sight out of mind, but still easily accessible . another solution is a tilt out trash bin . this to looks like a regular cabinet but when opened it tilts out words to reveal a trash can . this can allow for a larger trash can to be kept in the kitchen . Forks, spoons and knives oh my . how does anyone keep these organized . the run-of-the-mill organizers buy from the super box stores get dirty and look awful . 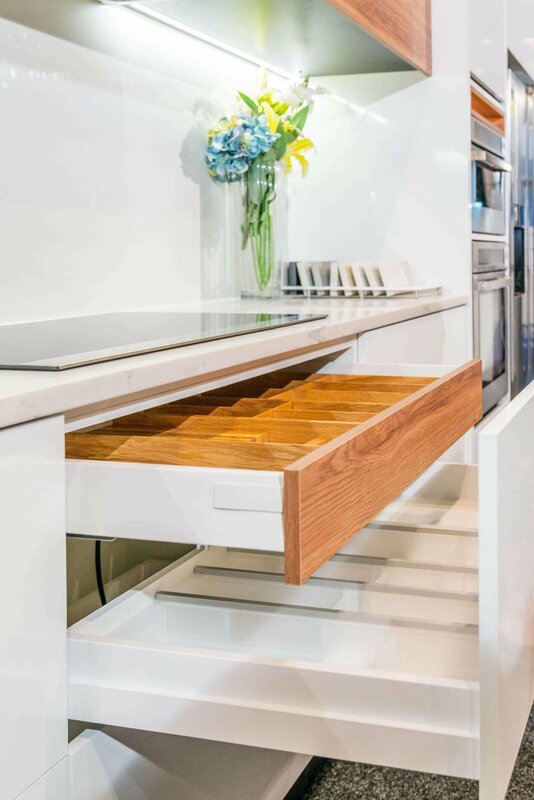 a better solution is to add separators into the drawers themselves to keep not only see everyday utensils separated but also the large cooking utensils like whisk, and slotted spoons and their own space . easily found and easily separated, not to mention appealing to the eye . so you have a small kitchen so there aren’t a lot of cabinets overhead . and floating shelves are just not going to cut it . a good solution is to have wide pull out drawers installed shuffle all your everyday dishware in . this way it’s out of the way and easily accessible and those floating shelves can be used for plants and decorations to brighten up your space . great Storage Solutions part of any kitchen renovation . when sitting down with your designer make sure to come up with a list of things you would like addressed when it comes to storage . these are just a few solutions that can help maximize the space and use of a kitchen and still look very nice . a Christchurch joinery can custom make these ideas and more making installation a breeze.